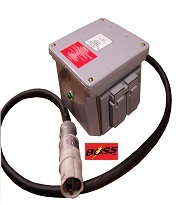 PORTABLE INDUSTRIAL RATED GFI’s – EXT CORDS are a group of products that are normally used together. 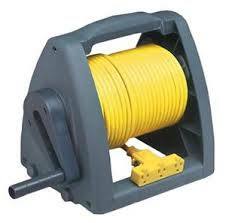 A 100 foot portable extension cord product used with a 20amp 120v portable ground fault in-line protection system. 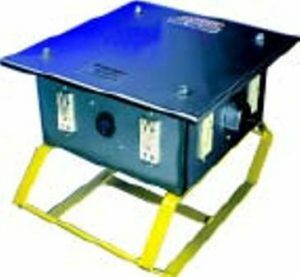 This type of portable product is required when using any portable electric power tools includes lighting products. Cord size represents the amount of amps the cord can carry per 100′ of cord length. 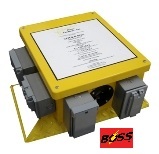 Each cord has a insulation code that represents the toughness of the cord to applications. 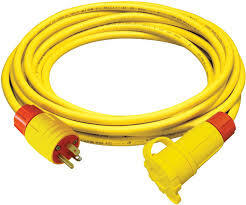 SO type rated cords are the most common and are required by OHSA for outdoor usage. When cords are to be used in wet location the letter W is stamped to the suffix of the cord code, SEOW. 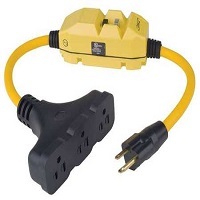 INDUSTRIAL RATED GFI – EXT CORDS must be used when powering portable tool and temporary portable lighting products. 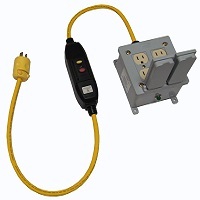 GFCI is a safety device that protects user from electrical phase to ground shocks.